You might recall I’ve been trying to overcome my fear of yeast. There have been some successes, some failures, and some that were too close to call either way. So when I got my copy of Nick Malgieri’s bake! and saw that his bread recipes seemed far more accessible to my yeast averse self, I wanted to start baking immediately. Mother Nature came through town and deposited a blanket of snow shortly thereafter which resulted in an unexpected weekday afternoon trying to coax magic out of some flour, yeast, and water. I can not tell a lie. I struggled with this method. And by struggle I mean that I threw an entire batch of dough away because I was convinced that I had somehow manged to do it wrong. The instructions and photos conveyed the notion that the dough would fully incorporate all of the flour with the deft use of a rubber spatula. Not the first time I tried it. And not the second either. Both times I used half the flour to make a paste. Both times I added half of the remaining flour and began folding. Both times I struggled to get the first half of the remaining flour incorporated, let alone the second half. Seeing how I got the same results both times, I decided to continue on with my second attempt and see where it got me. Where it got me was up to my wrists in dough. Because even my sturdiest rubber spatula could not get the upper hand. So I chucked it aside and used my hands to gently fold the flour into the dough. I was able to get all but about 1/4 cup incorporated. There was a rise, some folding, more rising, and more folding all while I said a little prayer that all this work would result in something bread like coming out of my oven in a few hours. It wasn’t until the dough had sat for an hour’s rise that my fears started to dissipate. When I uncovered the bowl, I beheld the sight of doubled dough. After some shaping and resting, the boules were slashed and slid into the oven. Thirty minutes later, I pulled out the lovely loaf you see above. I still can’t say whether my procedure was wrong or if my expectations were incorrect. Oddly enough, I had a similar struggle with dry dough when I made Nick’s Quick Brioche. But based on what he said at our bake! get together, his recipes are tested before they go to print. So until I find reason otherwise, I have to say the problem lies somewhere in my kitchen. Rubber spatula? Hmm. I’m a big fan of the wooden spoon for incorporating flour into bread dough. I can’t see a rubber spatula being the best tool. Maybe professional chefs have some sort of nutso rubber spatulas with gigantic, heavy wooden handles?? In the end, you did get one pretty loaf of bread! Actually, I think pros probably have incredible muscles after years in the kitchen. I’ve got my eye on the KAF doug whisk but it is too big for my utensil drawer. Sometimes instructions aren’t as descriptive as they should be. Bread is something that I long to make (the smell of baking bread… yum) but the time it takes to make it is a complete turn off. The bowl-to-mouth ratio needs to be much smaller in order for me to even attempt. Brooke, I need to better understand this bowl to mouth ratio that you speak of. The faster it can be made and then shoveled into my trap, the better. Brownies are a win because as they bake, I can batter up my tongue. Tis the reason I make sheet cake instead of cupcakes – it takes me less time to get it from the bowl to the oven and into my face. It’s a theory I’m working on. Dear Brooke, your logic suffers from one fatal flaw…cupcakes take less time to bake than a whole cake. AND since cupcakes mean multiple batches of baked goods coming out of the oven, there are greater opportunities for stuffing your face in the name of quality control testing. My friend, you need to embrace the cupcake. Nope. Nuh-uh. You have to ice every. single. cup. cake. Takes up WAY too much time for this baking good beast. i’m kinda freaked out. TWICE. you tried it TWICE. but the end product looks loverly. will do this again, do you think? What can I say, I am a glutton for punishment. I don’t think this will become my boule recipe. But I need to jump back into the book for cakes and pies. Elizabeth, how have you made out with the recipes in the book? I wish I could help you . . . but so far I’ve really only ventured into the realm of quickbreads. No yeast involved. Actually that’s not entirely true–I tried to make some yeast-based rolls last year and they were a DISASTER. So maybe that’s why i’ve been staying away. Jenna, I found a super easy dinner roll recipe. It will change everything for you. Promise. I think Bake! 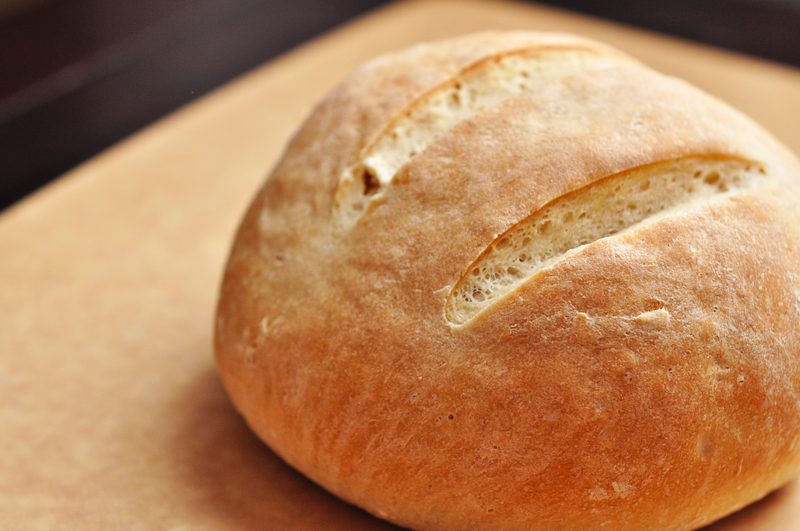 may not be your best source for bread baking. I think I would look elsewhere. And the dough whisk rocks! Beth, good to know. I am hoping to have better success with the other recipes. Sadly, neither Lan nor I won a dough whisk at the demo last week…they gave away two! As for the rubber spatula and not being able to incorporate the flour… There are very few recipes where I am able to incorporate all of the flour with *ANY* utensil! I love my dough whisk from KAF, but that only gets me about half of the way there. I always end up kneading by hand. Spoken like a true bread baking pro Jen. With those things in mind, I “may” give this another try and see how I like the results. I would not be worried about that extra 1/4 cup. Depending on where you live and where you get your flour, the moisture content in the flour can vary, leaving you requiring more or less flour for a particular amount of water. Humidity, altitude, and temperature all play a part. Since the bread turned out I’d say you did a fantastic job! Those are great points that I neglected to consider Danielle. I think since this book is marketed as being a “how to” for less experienced bakers, I assumed that they had determined that all of the flour would be used. Yet again I put too much stock in what’s written on the page and not enough in my own instincts and sensibilities. That is an absolutely perfect loaf of bread. Really, it looks like it came straight out of a bakery. Congrats on persevering through this recipe!